This is a basket of biwa, a fruit I'd never heard of until I came to Japan. Called "loquat" in English, it's a distant relative of the apple with soft flesh, an edible peel and a sweet, mild, pear-like flavour. It's originally from China but has spread throughout the warmer countries of the world, and has long been grown in Japan. Nagasaki and Chiba are top producers and biwa products are popular souvenirs for visitors to those prefectures. It's now considered rather old-fashioned here and few people bother to plant biwa trees these days, even though they seem to produce a lot of fruit without a lot of effort. I sometimes see biwa trees in older gardens where the fruit often goes unpicked (I've noticed the same thing with other "old fashioned" fruit fruit here like figs and pomegranates), which always makes me sad. In Japan it is available fresh in May and June and doesn't keep very well, so should be eaten the day you buy it when it's nice and juicy. It's best served chilled and as-is: just peel the the skin with your fingers and eat the flesh, avoiding the large seeds in the middle (it's messy work though, so if you're Japanese you'll want to serve it peeled and sliced). Biwa tends to be a little pricey, with a small package of six or so going for 500 yen and up, and as it's not the most exciting fruit in the world I rarely think it's worth buying. But it's definitely a nice treat once or twice each season. The biwa shown above are not prime specimens: they were sold at a discount due to being old and shriveled. I decided to buy them and as they were too far past their prime to eat fresh I made a small batch of jam. 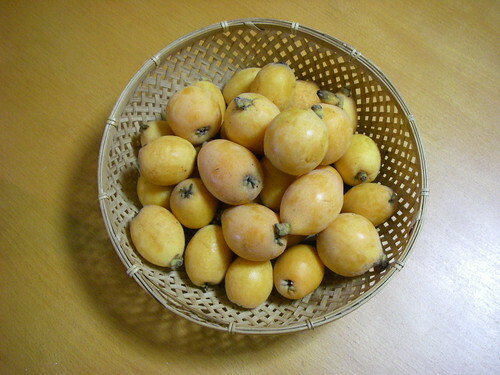 It was easy and set very well, as loquats are high in natural pectin, and tasted nice, if a little bland. Next time I might try adding some spice or mixing in some other fruit (cinnamon and/or would be nice for the spice, and cherries might work well as they're in season at about the same time). It's such a simple recipe that I thought I'd share it here, so read on if you'd like to try making this for yourself. Wash fruit and cut lengthwise around the seeds, twist to open in half. Remove seeds, stem and blossom ends with fingers, and cut away any bruised or blemished parts. Don't remove the peel- that's where the pectin is! Chop the halved biwa roughly and add to a non-reactive pot. If using a cinnamon stick, add it now. (Note that the pictures show halved biwa in the pot, but as I discovered it takes a long, long simmer to break down the the fruit and I ended up using an immersion blender to help break up the skin. It was messy work and not recommended!) 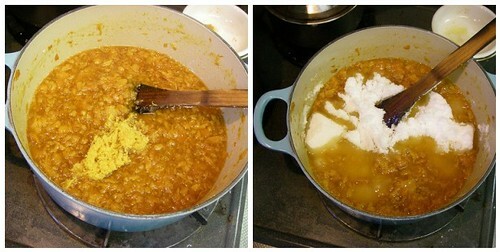 Add about 500 ml water, or enough to barely cover, and simmer until pulpy, about one hour. Add more water if needed. While the fruit is simmering, zest and juice the lemons. A citrus juicer and microplane grater make quick work of this, but if you don't have those don't fret. In a Japanese kitchen you can use an oroshigane (daikon grater) to zest the lemon (hint: run lemon juice over the grater to remove any stubborn zest that sticks to it), or you can just use a peeler to remove the zest (just the yellow part, don't peel off the white pith), then chop it finely. To juice a lemon without a juicer, simply cut it in half and stick a fork into the flesh, taking care not to pierce the skin. Holding the lemon over a dish, squeeze around the fork until you've got all the juice out. Once the fruit has broken down add the lemon zest and juice. If you're using ginger, add it now. Add sugar to taste. Biwa is a sweet and mild fruit, so too much sugar will overwhelm it- I used 500 grams, but you could use more or less. 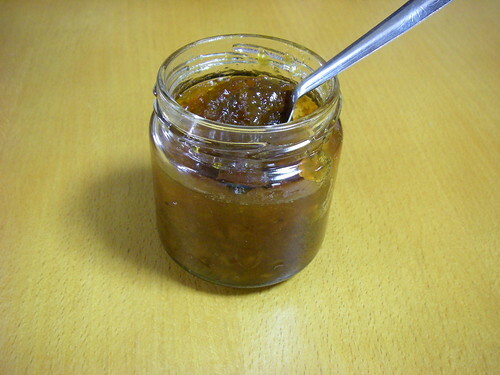 Increase the heat and boil until a small amount of jam sets on a frozen spoon or small dish. Ladle the jam into clean, sterilized jars (I filled up five 200ml jars, but this will depend on how much the fruit has cooked down). Screw on lids and set in a quite place to cool. Store any jars whose lids don't pop in the fridge and eat quickly. 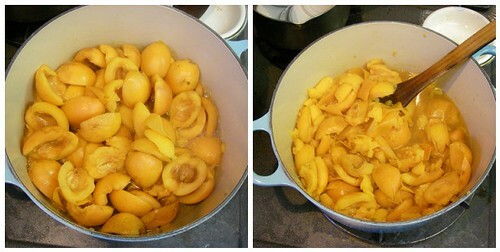 my mom always picks the loquats from our neighbor's tree (because they don't eat them) and turns them into jam too. this looks really delicious! Aha, I was wondering if you left the skin on when i saw the pics on Flickr, and now I know! Ginger would be a fantastic addition I think. Strange but the "old fashioned" fruits are all my favourites! We have loquat trees everywhere in Florida and sadly, I think most people who have them don't know what they are and the fruit goes unpicked. 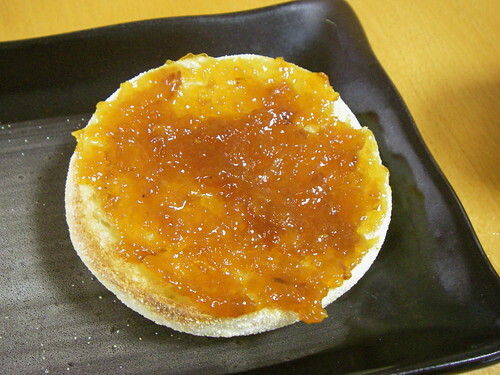 You know, I was looking after biwa jam 2 weeks ago, as I finally got some biwa fruits, here in Germany they are not easy to get.I didn't find much recipes. I have read the seeds are toxic, is this true? In Portuguese they're called 'Nêsperas'. How timely! We have loads of biwa here in Chinatown, Los Angeles, so if I get treated for a bag of them in exchange for some guavas from our tree, now I'll have a great recipe for them - thanks! Just came across your blog while looking for a Japanese recipe for chige-nabe stock that I could easily understand and find ingredients for (we're making that tonight) and your blog is so "natsukashii"! I moved to Tokyo in 1997 and my souvenir from seven years of voluntary exile and I have since relocated to L.A.
Oh yum! Loquats are a popular ornamental at our local college. When I was attending, I use to look at them with curiosity until a fellow student (half Japanese) showed me how delicious they were. The rest of the semester, I'd leisurely snack on them whenever I had to go to class or the library. Word must have spread though b/c I went back a few years later, and all the loquats were plucked clean except for the tallest tips of the trees. You could see some broken braches where no doubt some eager students had "harvested" a free treat. In California, where I grew up, there were loquat trees all over the place that no one ever picked. They were just grown as ornamentals. My sister and I would climb them and sit in the tree eating. Of course, it was California, so there was no water for the tree and the fruit was never very plump like yours are. Yum! Wow, everyone has loquats where they are! I'd never heard of them before I came to Japan so consider them totally exotic and Japanese. What a surprise to see they're grown all over. It is a shame that so many people don't know they're edible. Don't people get curious about the fruit they have in their own yards?